Welcome to Tale Spinner, Icy Snow Blackstone. Icy Snow—that’s an unusual name. Where does it come from? Icy Snow Blackstone was born in 1802, in northern Georgia where her father, the Reverend John Blackstone, was prominent in local politics. She married a minister, raised seven children, and lived there all her life. Two hundred and five years later, her great-great-great-great-granddaughter began using her name as a pseudonym for her romance novels. The present Icy Snow Blackstone lives far from her Southern roots in Lancaster County, Nebraska, where she continues to write romances. As of 2017, Icy Snow has eleven novels published by Class Act Books. Her contemporary romance, Tuesday’s Child, was given the Paranormal Romance Guild’s Reviewers Choice award for Best Contemporary Novel of 2014. A SciFi romance, Earthman’s Bride and Vietnam-era romance Jericho Road, have also received awards. Icy Snow Blackstone writes romances set in the South. After viewing the movie Sullivan’s Travels on TV, in which a millionaire disguises himself as a hobo and travels the rails seeing how the other half lives, she was inspired to write her own version in which a millionaire runs away from his responsibilities and gets stranded in a small Southern town. 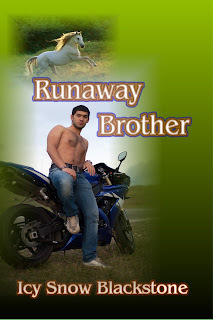 After some twists and turns and revisions, Runaway Brother was the result. So, what’s the story about? At the age of twenty-two, newly-graduated Nicolo Liguori is forced by his three brothers to become care-giver for his father, who suffered multiple strokes. For the next ten years, Nick gives up his own ambitions , working during the day in the family jewelry business in Vanderhoek, New York, and returning to the Liguori mansion every night, to be at his father’s beck-and-call. Then Papa dies and Nick is free…or is he? Carlo, Marco, and Pietro expect him to continue life as usual, but Nick has other ideas. Secretly buying a motorcycle, he starts to work one day and… disappears. Nick gets as far as the southern coast of Georgia before an accident disables his bike. Stranded, with no idea of the South except what he’s seen on TV, Nick isn’t certain what kind of reception he’s going to get. Then, a pretty Southern miss and a white tank disguised as a temperamental horse named Shazam change his life as they and the citizens of Oceano teach a runaway Yankee about life and love in a small Georgia town. The track was getting narrower, barely two ruts now with a width of slender, wiry grass separating them. He slowed the bike. Don’t want to get that stuff caught in the spokes and stall the engine. Nick raised his head, looking around, then gave a loud sigh of exasperation. Okay! So I’m lost! He’d just follow the road to wherever it went, probably to some farmer’s front yard. When he got there, he’d apologize, turn around and get himself back to the main drag. If he could find it. A broken branch loomed ahead, and he turned his attention to it, guiding the bike around it. A second branch and several twigs littered the roadway. Nick was so concerned with maneuvering around them he didn’t see the horse sail over the fence, wasn’t even aware it was there until he looked up and found the white shape almost directly in front of him. The motorcycle went off the road, sliding into the ditch and running up the other side, the front fender striking one of the fence posts. It bounced and rebounded, and Nick went flying over the handlebars, flipping in mid-air and hitting the same post with his back. The bike wavered a moment, then toppled onto its side. Nick slid down the post, landing upside down in the ditch, his shoulders crushing coffeeweed into an aromatic mass. The pounding hooves stopped. He heard running footsteps, opened his eyes and saw someone running toward him. He closed them again. This time when he opened his eyes, he was staring at the upside-down face of a very pretty girl, at least she’d have been pretty if her face wasn’t screwed up into such a dismayed scowl. He’d gotten upright, took a step, and his leg buckled, turning at the ankle. “Here.” She slid into the ditch, offering a hand. Reluctantly he took it, being careful not to put too much weight behind it as he let her pull him to his feet. He could see she was worried and he really wasn’t hurt all that bad, but he was angry because she’d been so reckless. Nick got down on one knee, feeling under the bike. His hand came away wet. He sniffed at his fingers. Gasoline. He pulled off one glove, exploring gingerly. Something had punched a hole in the gas tank and gasoline was pouring into the grass. He had no idea how, but it didn’t matter. What did was that he wasn’t going anywhere as long as that hole was there. “Well?” She appeared to be awaiting his diagnosis. Oh Lord, deliver me from small town handymen! He was about to tell her he didn’t want Marshall touching his bike when he realized, What else am I going to do? Do you have a better idea, Mr. Runaway? “So which way is town?” He straightened, looked around as if expecting to see the city limits a few feet away. She clambered up the bank, running toward the horse now grazing on the other side of the road. Catching the reins and a handful of mane, she swung into the horse’s back—very gracefully, he noted—then turned the animal’s head and trotted it back to him. “You stay right there,” she told him. “I’ll be back in a jif!” She kicked the horse in the ribs and sent it galloping down the road. Nick turned his attention back to the V-Rod. It hadn’t moved. Did he expect it to get up and limp over to him like a dog with a hurt paw, whimpering for sympathy? Shaking his head, he leaned against the edge of the ditch, back against a fencepost. The Pit & the Passion on Cover Wars!